"41CE17, Burial AL-7, 25" by Timothy K. Perttula and Robert Z. Selden Jr.
DECORATION: The rim has four rectangular engraved panels defined by two sets of two closely-spaced vertical lines. Within each panel are three concentric semi-circles that are attached to the lower (at the carination) horizontal engraved line of the panel. Poynor Engraved, var. 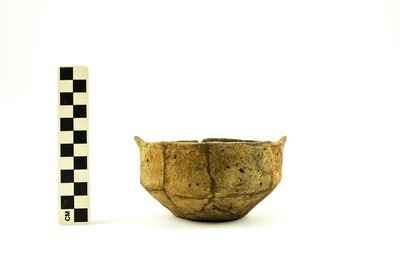 S carinated bowl with effigy tab tails from the E. W. Henry site (41CE17).